Auvillar is a historical village with a colourful trading history. It is situated on a rocky outcrop and over-looks the powerful and sweeping Garonne River, Auvillar is one of France’s most beautiful villages and has been in existence since Gallo-Roman times. The main part of this village with its stunning circular halle, unique clock tower and beguiling church, can be found high up above the river’s flow. It’s the important lower ‘port’ area, however, that has proved critical to the prosperity of this village. Situated between Toulouse and Bordeaux (with its access onwards to the colonies and the world at large) Auvillar was perfectly located (during the centuries of transportation by river) to produce and distribute its wares. Tolls were collected on the river at Auvillar and this meant that all vessels had to stop there; evidence shows these payments being made as far back as 1204. Boats from Bordeaux (batellerie) would arrive, sailing upstream, originally pulled by men in harness and then later by oxen and horses; these would bring salt from the sea. The boats sailing down-stream would be carrying primarily wine, grain, pottery, goose feathers and even the precious crop of woad. To illustrate how busy this little river port was (in 1841) 411 tons of goods were passed daily and, in 1837, there were a total of 2256 vessels travelling between Agen and Auvillar! Today, if you sit on the grassy riverbank it’s hard to envisage the noise, smells and activity that must have prevailed then. At the port there remainsa chapel, now sadly dilapidated, which was dedicated to the patron saint of river mariners and philosophers; Saint Catherine of Alexandria. This chapel is believed to have been built in the ‘Carolingian’ period. It’s just possible to see, a monogram of Christ dating from the 9th century, above the main chapel door. By 1789 there were 49 boating families living in the village and forming a settled-core amongst the additional transient river-folk. 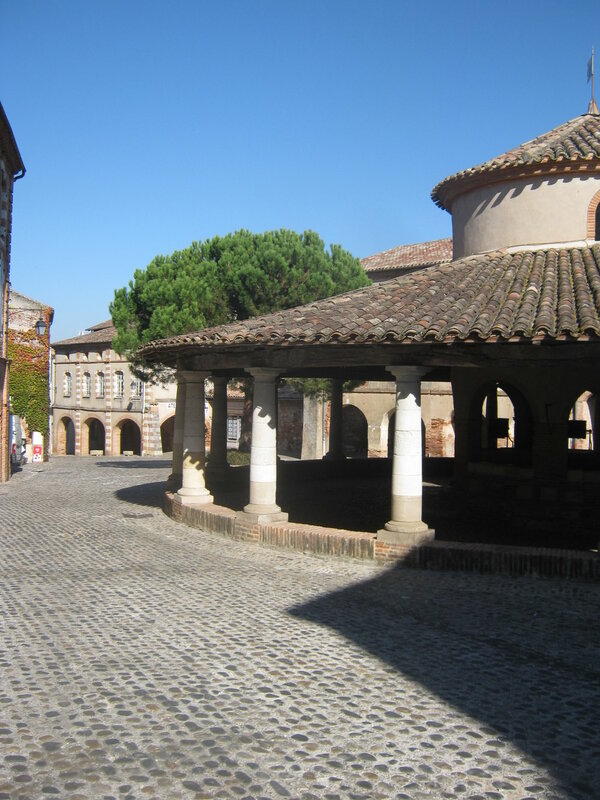 Since the middle ages Auvillar has attracted artists, serving as a centre for poets (and in the medieval times – troubadours), painters, calligraphers, sculptors, musicians and ceramicists. If you then add to this mix the many pilgrims that would halt here on their pilgrimage, following the route of Saint Jacques of Compostella, you can start to imagine the sort of atmosphere that would have filled the narrow streets and crowded taverns. Importantly, by 1700 there were between 300 and 400 potters in Auvillar, fulfilling a new national demand for earthenware pottery. This national demand had been instigated by Louis X1V (who’d created a large budget deficit with his war-mongering) and so he raised money by insisting that all the nobility, clergy and middle-classes hand over their gold and silverware, which included a large number of items used as crockery to be smelted for funds. Replacement crockery was, therefore, needed all over France! Having an efficient transport system wasn’t the only factor that encouraged the development of this industry here in Auvillar – there was also a good supply of the basic raw ingredients. Clay and chalk were waiting to be quarried from the ground immediately surrounding Auvillar. This was then purified, kneaded, washed and sifted before being stored for up to 5-6 months. Over a period of over 200 years different illustrative styles of this earthenware pottery were produced, the earliest were coloured simply with blue and then other colours and glazes were gradually introduced; after the French Revolution the palate opened up even further with the additions of particularly red and orange. 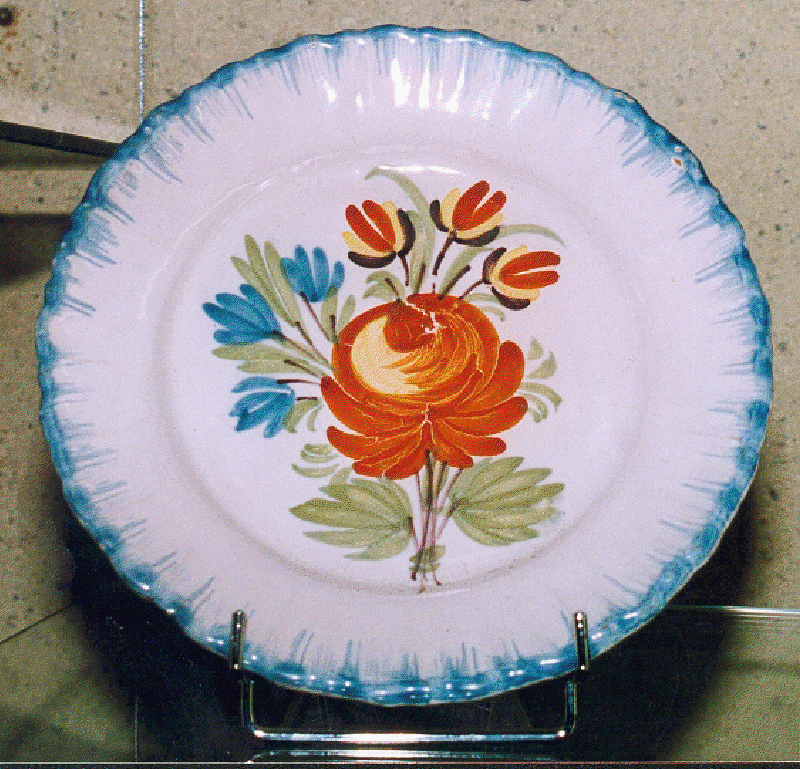 There are typical styles of Auvillaraise-illustration, most obviously is a common floral design, often with roses or tulips, and normally in the centre of the plate or piece. Other designs included simple birds or landscapes, often a river-scene. Huge quantities of this earthenware were produced, indeed in 1848, some 1,300,000 items were manufactured. Once you have examined a few pieces of this faience pottery you’ll soon find you can recognise it again. Faience was the name given to the tin-glazed earthenware, found across France, Germany, Scandinavia and Spain. Similar items, produced in Italy, were called majolica and those produced in England and the Netherlands were known as delft. The last of the factories closed in 1905; unable to compete with the new larger mass-producing centres such as those found in Limoges. The museum in Auvillar exhibits examples of this pottery and it makes a great starting point for anyone interested in the fascinating development of this locally produced antiquity. A quick search on the internet will produce a selection of items for collectors, this is also a great way to familiarise yourself with the different designs, all of which could tempt any reformed pottery collectors back to their art. For more information on the Museum de Faience (and all other aspects of local history – particularly ‘life on the river’) do see www.auvillar.com. The village has a number of cafes and restaurants, as well as a bakers. In October there is a weekend of pottery markets and the December Christmas markets have long been a local favourite.